Earlier this fall I set out with a group of students to survey cheap eats and sweets on the Lower East Side. In spite of constant weeping, wailing, and gnashing of teeth over the gentrification of this neighborhood — which for hundreds of years has been the home of one immigrant group after another — we found that much history and tradition remains, and even the most recent immigrant groups have contributed to the ongoing smorgasboard for the tastebuds you can find within walking distance of our apartment. Endangered cultures? Maybe, but it felt more like peeling away layers of a very old onion, getting down to some very old foodways at the center. Stop #1: Yonah Schimmel’s Downtown Knishery. 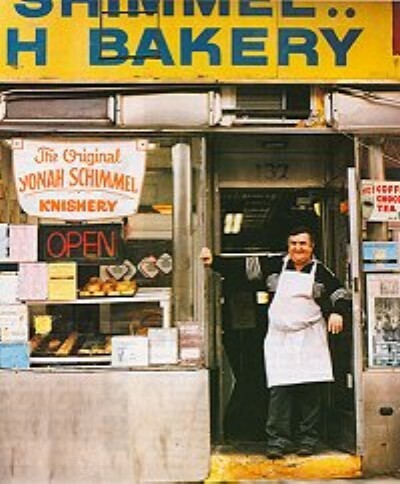 Yonah’s has been dishing up brick-sized knishes since 1910; before that, beginning in 1890, Yonah sold them from one of the pushcarts that were ubiquitous on the LES. If you’ve never had a knish, get yourself to 137 East Houston ASAP. (It’s past Whole Foods but before the Sunshine Theater.) If you’re already a devotee, tell me if you know where to find one better and more authentic than these. Warning: You probably can’t eat one alone — they’re that filling! And for under $3! — so bring a friend. Though we didn’t make an actual stop, we noticed the enormous cookies and other sweets through the storefront windows of the Sugar Cafe, at the southeast corner of Houston and Allen. 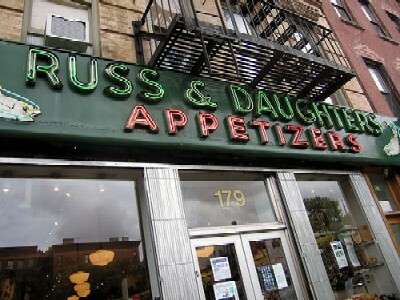 Stop #2: Russ and Daughters, another reminder that this tenement neighborhood was once home to millions of Eastern European Jewish immigrants and their children, has been down the street from Yonah’s (at 179 East Houston) since 1914. It’s a lot glitzier than the knishery — serving up caviar, smoked fish, cream cheeses, dried fruits, and chocolates from glistening glass cases — but it’s still possible to get something delicious here without breaking the bank. 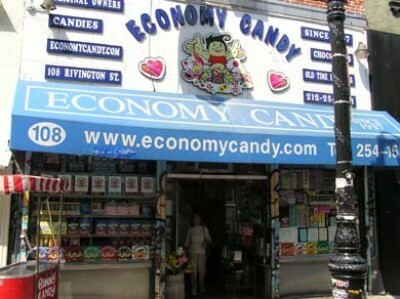 Stop #3: Economy Candy, at 108 Rivington, is an old-fashioned candy lover’s dream. Think of the biggest Halloween haul ever. Need a gigantic Homer Simpson Pez dispenser? A gazillion varieties of Halvah? Candy bars from your childhood that you didn’t think they made any more? We were hit by a sugar rush simply by the smell when we walked through the doors; packed floor to ceiling with goodies, this place is as good for eye candy as for actual sweets. Heading back up to Rivington, we turned right and made Stops # 4 and 5: We split into two group to browse sweets on the north side and savories on the south side of Rivington, between Essex and Norfolk. For sweets: Sugar Sweet Sunshine Bakery, at 126 Rivington, a breakoff from Magnolia, which many Eastsiders claim outdoes the original. For savories: Dash Dogs, perhaps the most amazing hot dog joint you’ll ever encounter — an endless array of toppings and combos for the good old All-American Beef Kosher. It’s just across from the Bakery at 127 Rivington. 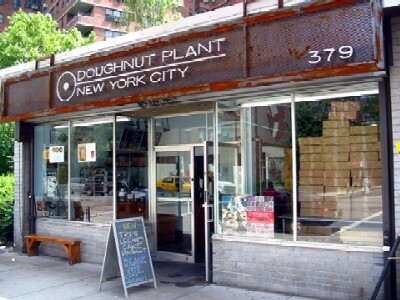 Stop #6, the Doughnut Plant, at 379 Grand, was closed, unfortunately, for Labor Day weekend, when we visited. We’d been anticipating a longer stop there to buy and eat something — finally! — but had to put it off for another day. It’s worth the trip for anyone who makes it: donuts the size of a human head! And light as air to eat. I recommend the Peanut Butter and Jelly: a jelly-filled with a chunky peanut butter glaze. Wending our way back toward our building, we headed up to Broome Street and walked west. This allowed us to make Stop #7, to peek through the windows at all the hipsters crowded into Babycakes NYC, at 248 Broome (near Essex), where you can buy vegan cupcakes that would fool anyone who didn’t know otherwise. Once we reach Orchard Street, we looked across the street to the left and noted that Guss’ Pickles was also closed for the holiday. Insert frowny face here. 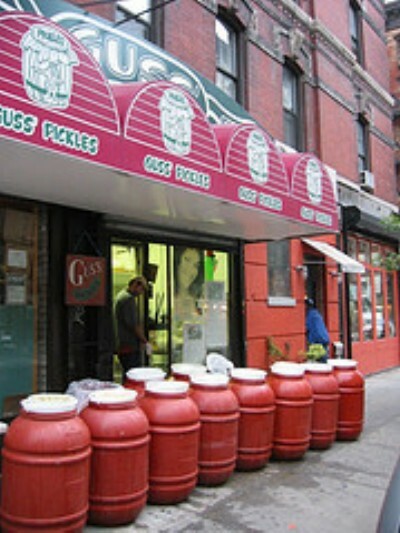 Guss’s is another place to return to for a fun — and historically accurate — neighborhood snack. (If you’re lucky, you’ll be in town next fall for the neighborhood’s annual pickle festival.) If you want to understand how historically accurate this place is, you can walk north on Orchard to the next corner and browse the bookstore of the Tenement Museum, my favorite NYCentric reading room. Better yet, take a tenement tour or walk the neighborhood with a museum guide, some of the best money you’ll spend on these blocks. We walked in that direction, not quite as far as the museum, to make our alternate treat stop — Stop #8, Il Laboratorio del Gelato. Purveyors of small-batch gelato for the last 5 years, this is already a much-beloved neighborhood institution. Walking back to Broome and turning west, in the direction of home, we made one final stop, to take a look at the menu board of Dumpling House, at 118 Eldridge, believed by many, including the Voice’s food editor, to be the best of the 5 for $1 dumpling places that have sprung up in recent years, the product of new immigration from China’s Fuzhou Province. With a pizza-slice-sized sesame pancake stuffed with beef (or tuna or vegetables or kim chee) going for only $1.50 and dumplings at 20 cents each, it’s entirely possible to get lunch for two for around $6, drinks included. We, of course, had somehow managed to go for dessert first, but more than one of us declared intentions to return later for dinner. Fellow city walkers: Do you have places you would have stopped if you’d been leading this tour? I love Economy Candy! It’s like a pack rat’s basement, only instead of junk, it’s floor-to-ceiling candy. When my little brother was 10 or 11, I took him there on a family visit. As we went deeper & deeper into the LES, my parents were looking around spookily, obviously thinking, “…Where the hell are we?… ” But little bro loved it. p.s. I remember sneaking one of those huge knishes into the movies once (with Steph). Yum! I think you were the first person to tip me off to the candy store, Rachel. I also remember your mom coming out with loads of Halvah. I can eat a knish alone, although it’s better to split a few so you can try different kinds. Somehow I stumbled on Yonah Schimmel’s the first time I visited New York. Based on some vague notion about knishes that I must have picked up from a book, I made my friends stop in with me and get some. Soooo good, although maybe I enjoyed them more than my friends did. Did you do this on purpose, Bryan, writing an entire post on sweets to coincide with Rachel’s birthday? Because No One loves candy and sweets more than she does. Happy Birthday, Rach. I’m wondering how in the heck you managed this walking tour when you’d also gone cold-turkey on the wheat and sugar?? Happy Birthday, Rachel! Here’s wishing you tons of yummy wheat and sugar products. Happy Birthday Rachel. Have a great one. Bryan, I love Halvah. Great post, My computer had issues and now I am back. By the way I am pretty open book, so you can whatever you wish. happy bday rach. i’m a bad friend — particularly bad at remembering birthdays — but wish you a happy one & hope it’s better late than never. if you want me to pick up something from the LES and ship it out, let me know. lisa — i had just started my 6 wks of no wheat no sugar when we went on the walk. it’s a good thing the doughnut plant was closed. and yes, i passed on the gelato. cynthia — to start, what brought you to this site? Thanks, everybody. Bryan, you are not a bad friend–we just got into a funny habit of not “doing” birthdays. So I’d like to issue a blanket belated birthday greeting to your whole family. Shipping knishes, hee hee. Sounds dirty. How about that candy store in Chinatown that has everything in bulk, the dried baby fishes and seaweed treats alongside the chocolate and gummies? A little outside your geographical scope, but definitely on the way there. Sweet jesus, you did everything! Economy Candy fills me with joy, even though I don’t like candy that much. (It just looks so pretty.) I have a friend who swears by the chocolate covered halvah at Russ and Daughters. We shared some once and indeed, it’s…it’s dangerously addictive. hey robyn — i was hoping you’d have something to add. indeed, on the tour i did point them in the direction of an egg custard king in the distance but we didn’t actually walk down far enough to count it as a stop. you take the best photos of egg custards in the whole world! oh — and i would count the ECK chain as a new LES thing — they’ve staked their claim pretty far east! I’ve been lurking on TGW for months, thanks to my classmate and friend Lisa T. who mentioned it in class one night. I never took any of your classes, but always wanted to take Writing New York, which Prof. Patell had mentioned you two were developing when I took his American Lit class (back in the day…). After reading your post today, I missed New York more than I have in months, and I regretted even more that I never got to take your class. Sigh. I’ll just have to make it back out there sooner rather than later. Thanks for the visual feast; it makes up for the wind storm I’m watching out my office window. re: my question in no. 7. i suppose it’s not necessary to add that no one has to give up any kind of personal information in order to participate here. i was just curious. commenters are entirely welcome to pitch in with whatever degree of anonymity they want to preserve, and there’s no requirement that people have some personal connection to the site in order to jump in. just in case i seemed pushy. hey — thanks for the kind words, jaimi. if i figure out how to ship a knish i’ll send one your way. 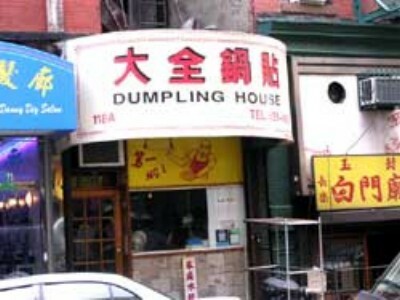 i don’t think the dumplings would make it, though. or the egg custards. no bryan not pushy, i was doing a search for school and found by accident. I am also a teacher in (so. cal) like many others and it peaked my intrest. I have enjoyed reading the posts and had wanted to join offically but I don’t know how. And as I said earlier I am a open book, so you can ask anything. I don’t mind. Okay, Bryan. I’m going to use this post when I go back to NYC. It’ll be a “Off the Beaten Path” day. Do you mind if I print it for my own reference? the knishes are good, but i feel like ya need a ton of mustard on them (not a bad thing) else they tend to be too dry for my tastes! i cant think of any other places in the LES that you missed, not counting new joints like Cocoa Bar on Clinton St (expensive gourmet chocolates). But speaking of cheap eats in the LES, has anyone ever eaten at the late-night kim chi stand at Ludlow & Stanton? It may be a thing of the past. I agree with Rachel about the Chinese candy store: Aji Ichiban. It doesn’t appeal to me that much (I think because of the lack of chocolate, something that Economy Candy has no shortage of) but it is cool to look through. Candy! It’s beautiful. I thought of something else to add: Kossar’s Bialys. Methinks it’s the only bialy-centric store in NYC. Mm, carbs! hey — thanks for this, robyn. i’ve never been there. and i don’t think i’ve ever had a bialy either. but this is very close to home and my six weeks without wheat are over. so count me in. also: ichiban — i’m a huge fan of dried and salted fruits and fishes and all manner of candies, so of course i like this place. plus they have free samples. which means after a night of flavorful chinese or thai food, you can stop in and sample some menthol licorice to cleanse your palette. Oh doughnut plant, what joy!